We know from Jean Baudrillard (and a few others) that the perfect crime - the one with no discernable body, motive, assassin or weapon - is the crime perpetrated against reality. The “truths” of this world are relinquished and our grasp on things swept away. Hyper reality, a symptom of our society of technology and communication, has snatched-away forever whatever we still knew of reality. An exaggerated reproduction now poses as the real world; a simulation which has taken so much care in reproducing the original’s imperfections, that it has become pure perfection itself. The representation of war could provide one of the notable manifestations of this collapse of the real and triumph of the hyper real (the “war of the fake” on the battlefield, as Umberto Eco might write). Not that the reality of war doesn’t still exist in itself (the pains are invariably still there in the experience of war) but the military event has been lost in the twists and turns of the mediatisation of war: the Vietnam War supplanted by its cinematic and media representation; the Gulf war, distant, spectral, virtualised to excess - “video-gamed”. 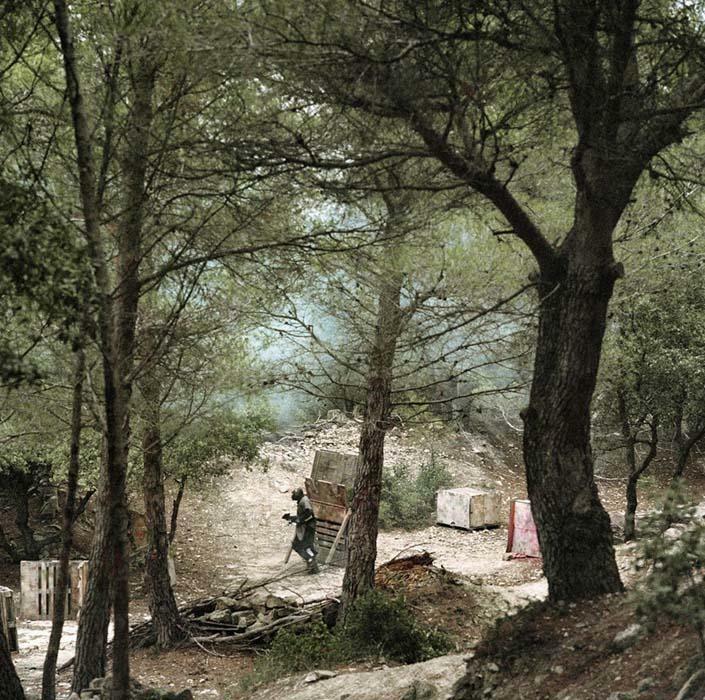 Everything becomes lost and distorted, so that what could first seem like informative images of armed conflict are in fact just idealised representations of martial factions. Communication against information. “To speak of things we want to denote as real, these things must appear real... “ writes Eco, even if this means they must become distanced from reality. Paradoxically, war was the subject of fiction before it was in turn subjected to a military theme. The courage of heroes, the subjugation of enemies, the surgically precise hits, the technical apparatus… All the things that pepper the action on screen gradually appear in political discourse and the theatre of operations . 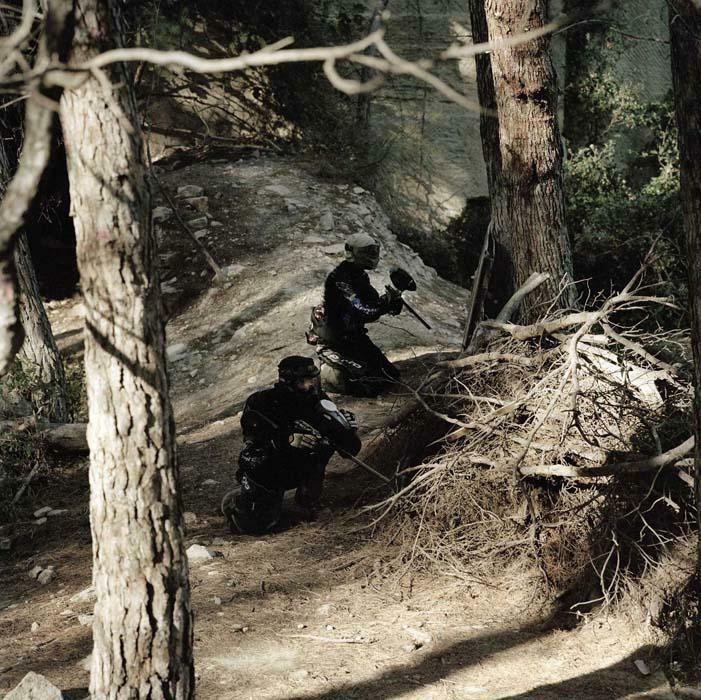 Special effects from blockbuster films are replayed in army recruitment advertisements , inviting young cinema-goers who enjoyed the feature to come and live the action in the field. The signified disappears, in the big blender of representation. Compressing, ingesting and rejecting with such force that pictures of war which do not play the game of stereotyping and “perfect truth” are excluded from the information system . 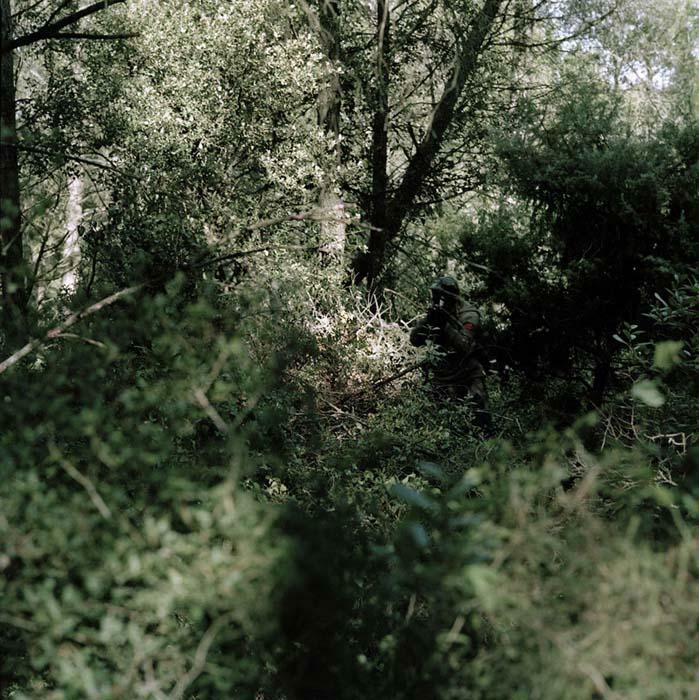 Brigitte Bauer’s Jeu de Forêt / Big Game series could be perceived as the exploitation of an advanced state of desubstantiation of the military theme. The ultimate level of reality’s assimilation of fiction (or vice versa). 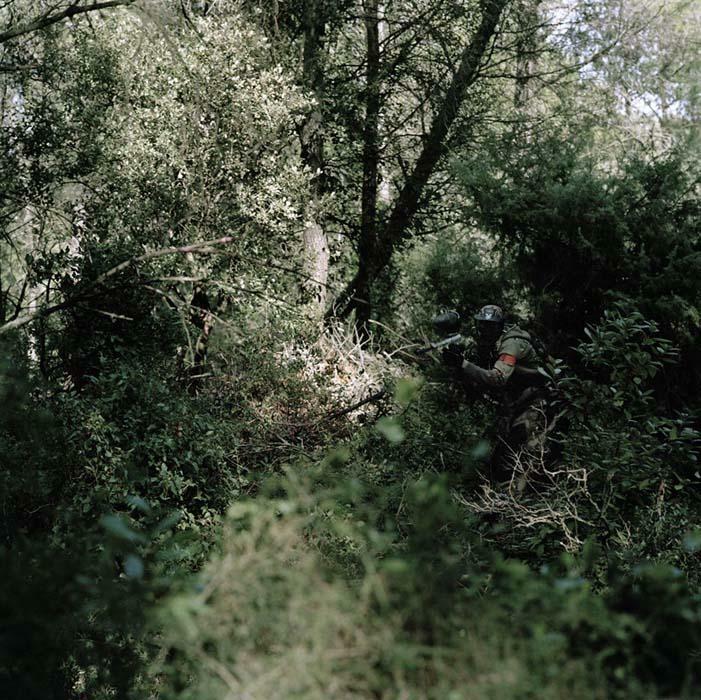 Comprising 19 photographs and one video, this work looks at a discipline that despite itself has made the loss of reference and the idealisation of military action the nodal points of its existence. 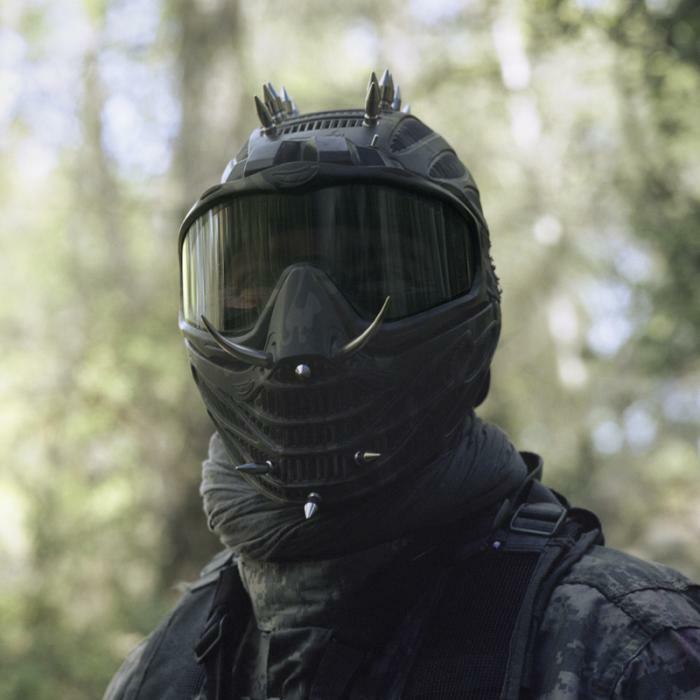 Paintball involves two rival teams coming into confrontation, equipped with weapons firing balls of paint. 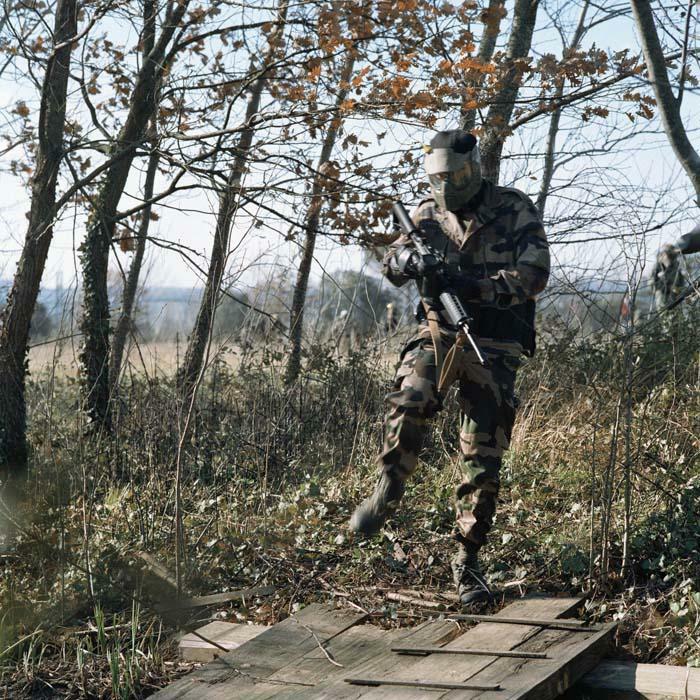 The principle is quite simple and includes a few variations whose outcomes and objectives remain similar: to confront adversaries, on a more or less bumpy terrain, in the reconstruction of an assault; to elaborate strategies; to burn energy; and to have a good time. All this represents a game that unlike sport generally, is not constructed ex nihilo, but is based on a representation - that of military conflict. 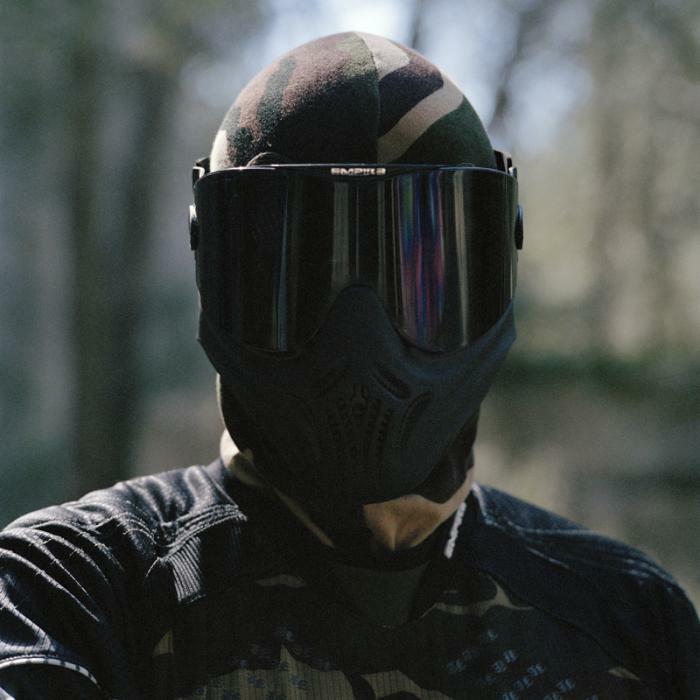 This specificity – enhanced by the fact that unlike video game simulation, the games take place here, in a life size backdrop, in the ordinary world – contributes to making paintball the visual manifestation of a disappearance, the privileged space for a sophisticated form of hyper reality. Here in the forest, Brigitte Bauer therefore is hanging the ruins of reality, amongst camouflage outfits and flying paint balls whistling past; 19 photos and a video that tell of this place of incessant frontier-crossing, this place where the contradiction between imagination and reality ends. Meticulously, the work seems to outline the still fresh scene of the perfect crime. 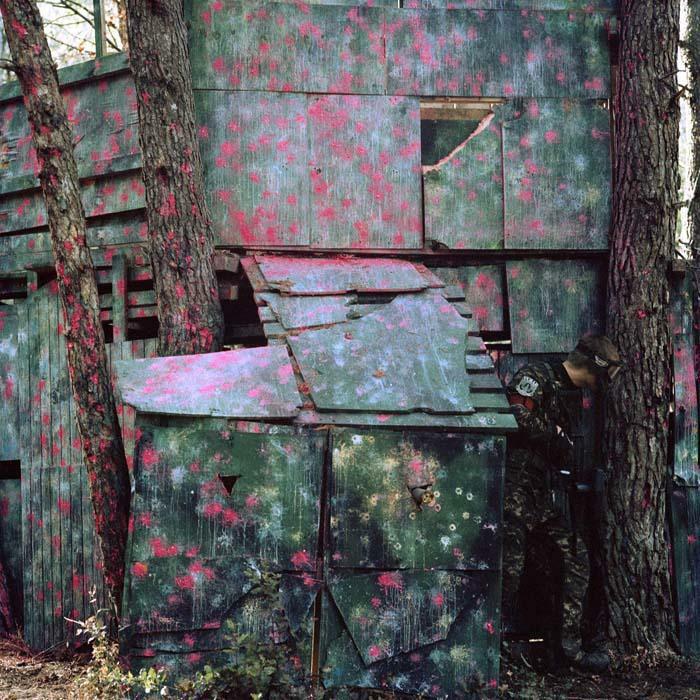 Lying still, wedged between a tree and a pink paint-splattered woodshed, a player waits, almost invisible. 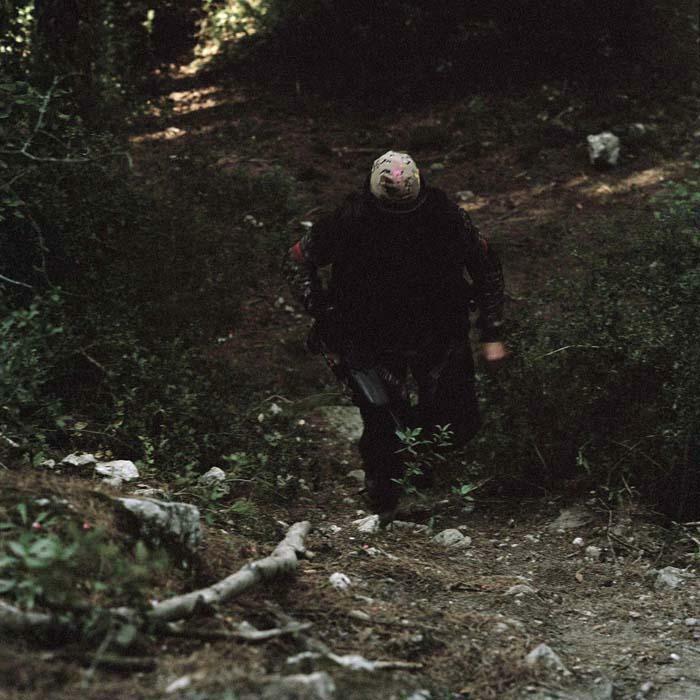 Another, knee to the ground, wearing a mask and army boots, surveys the distance through the trees. Elsewhere, donning an orange waistcoat, he presses his back to the wall. It’s an ambush. 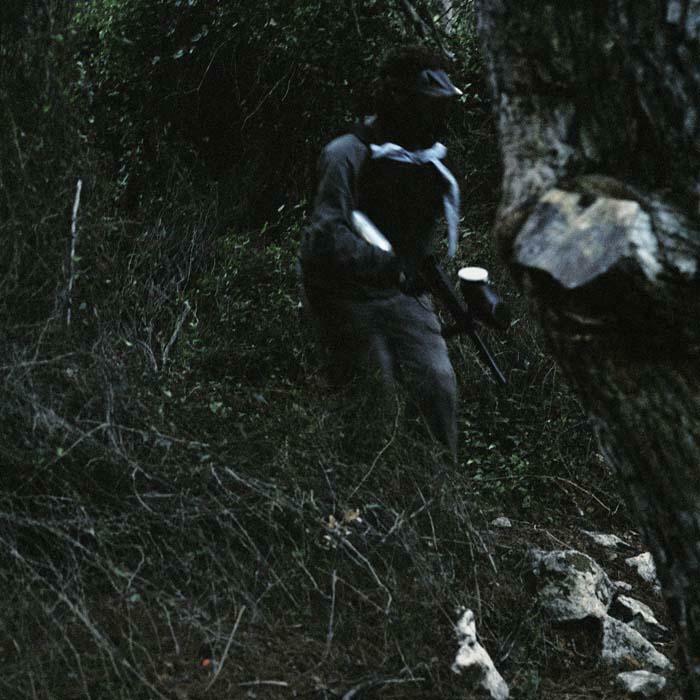 Two more – shadowy, dark figures - together, crouching weapon in hand and staring ahead… The men that appear in Brigitte Bauer’s photographs are awaiting the start of the action; metaphorically, they could be looking out for a sign of their rescue. 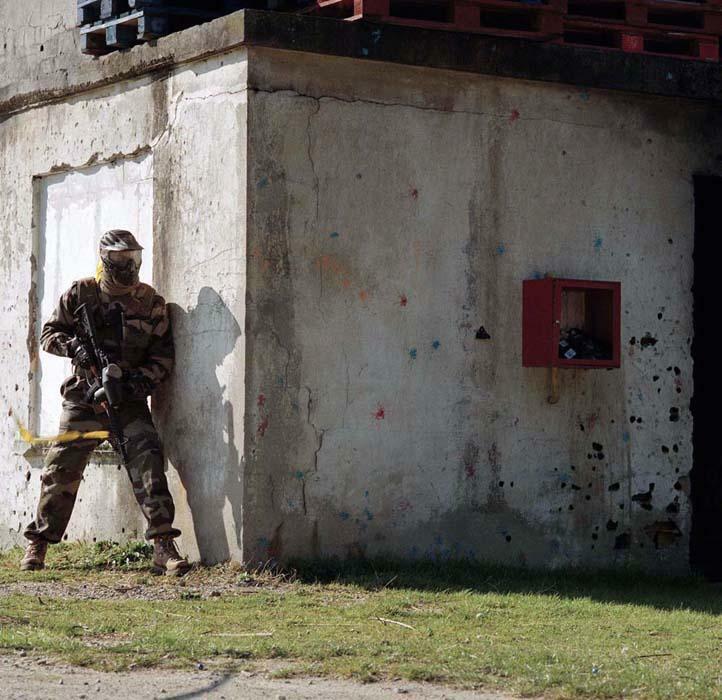 The end of combat signal indicating that nothing is left of what made reality, that they have annihilated it forever with brightly coloured shots of paint. Behind the masks they have left the rest of mankind behind to become the heroes of an imaginary war. Their faces concealed from the events of the world, they don’t engage in revolution or guerrilla warfare, but play at what these could be. An uprising reconstructed from action or science-fiction film codes. Furtively hidden behind the mask of entertainment, this shadow army is neither dangerous nor worrying (no insurrection on the horizon); it doesn’t deal in politics, but in adrenaline. Brigitte Bauer’s photographs don’t succumb to the temptation of critical judgement; intentionally, they say nothing of what is scandalously self-sufficient in these men’s game. That’s not the point. Art is not there to make a case, and even less to denounce open-air fun. The artist is not making a stand, but witnessing an absence in reality’s retreat from the scene. The Big Game series features an erosion more than it singles out an improbable guilty party. It captures the successive tides in the rippling away from reality and tells us that we have now reached the end of the sequence. 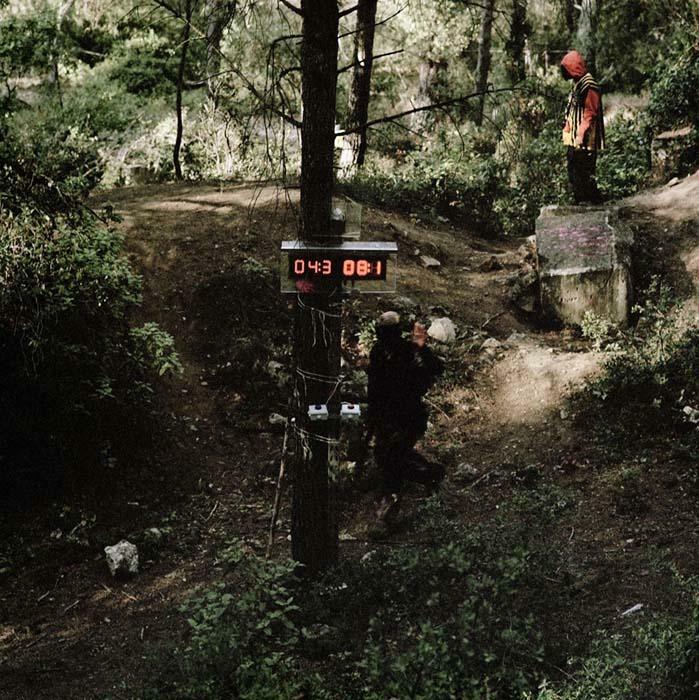 What Brigitte Bauer’s photographs and video show us is the picture of the game, based on the fiction, based on the media, based on the event. The simulation of the simulation, squared. More than just the recreational choices of a group of men, what the artist is interrogating here is the production, use and reappropriation of images. A questioning process that engulfs her own photographic work, since she is producing images of a practice based on visuals. And the artist’s viewpoint flickers, also transitioning between the heart of the action and the distance of observation. 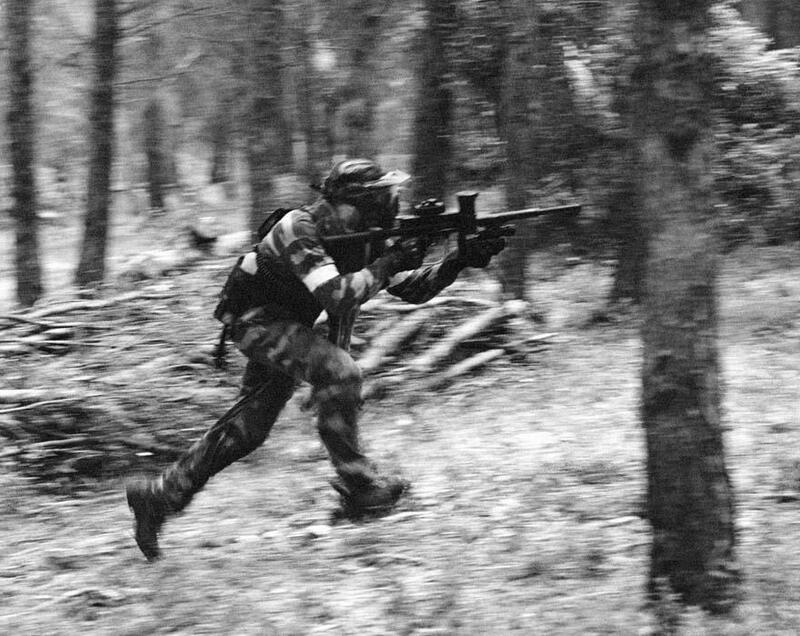 Despatched to the woods, in the middle of conflict, the challenge for the artist is not to fancy oneself as a war reporter. 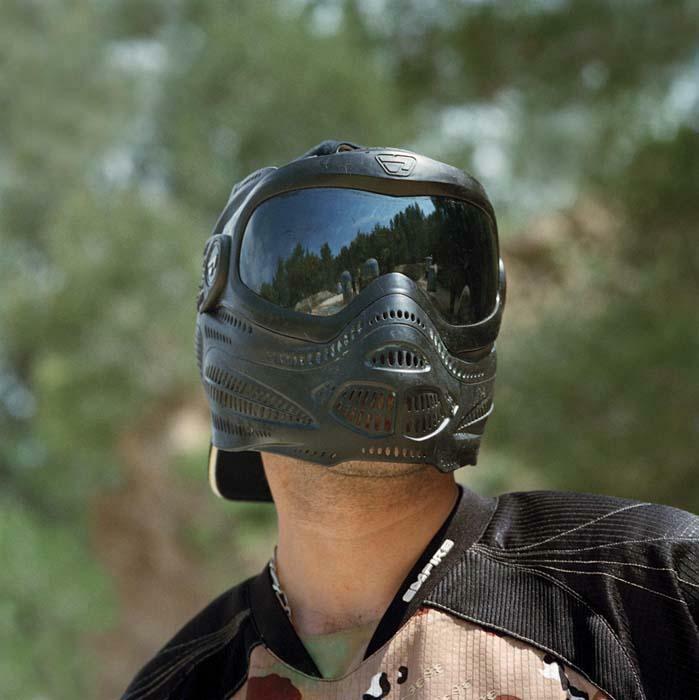 To keep focused and produce photographs that highlight the symbolic frontiers on which paintball operates. 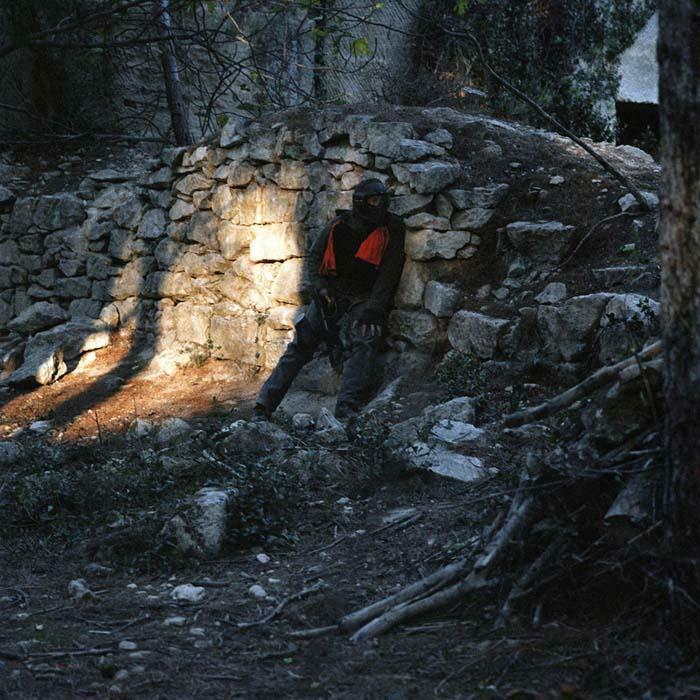 In the same way that camouflaged bodies disappear into the environment, the artist merges into the backdrop and captures the fleeting moments or the expectations of the fake soldiers engrossed in their game. She photographs their immobile journey towards a mislaid ‘here and now’. 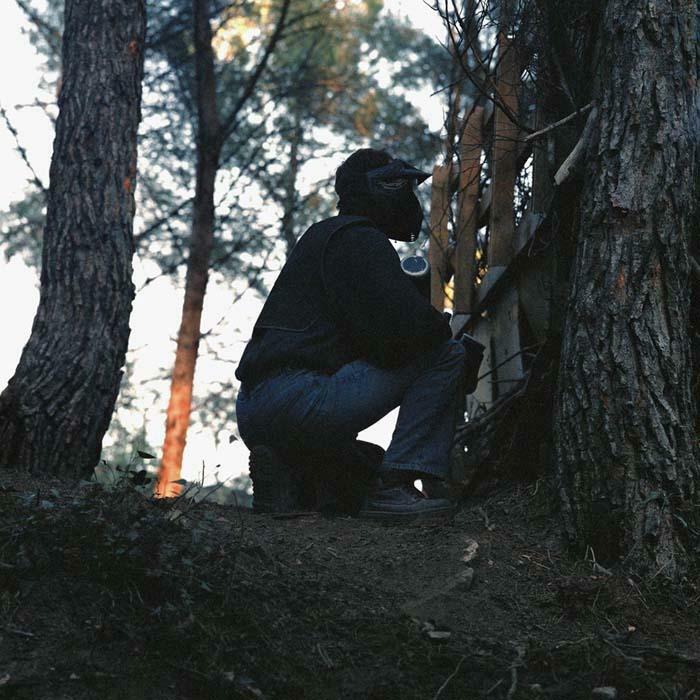 Jeu de Forêt / Big Game pays witness to a painless loss in the name of leisure and entertainment. The series manages to catch the unstable balance of a vanishing world, revealing an advanced state of dissolution, and the precise point at which reality and its representation merge into disappearance. 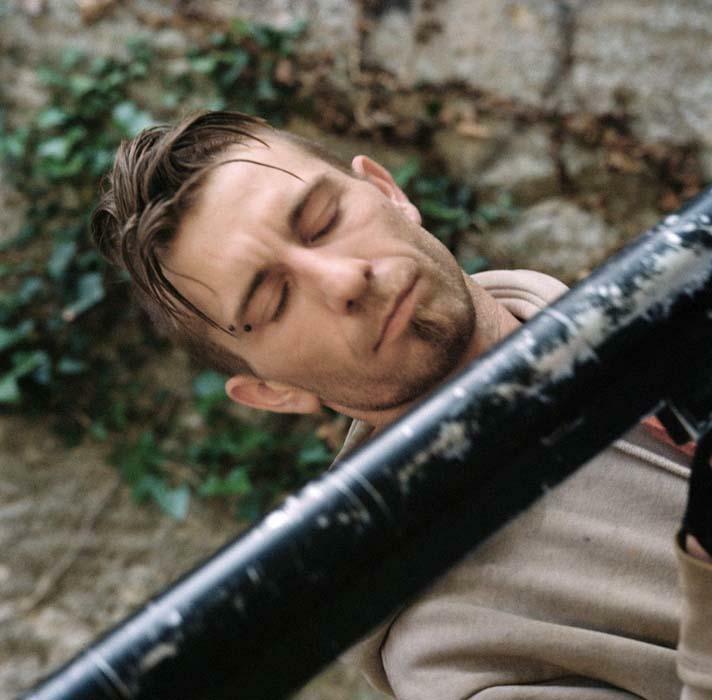 Through her work, Brigitte Bauer documents this vanishing that takes place under the averted gaze of a few men, who, looking straight ahead, fingers on the triggers, prepare to finish off with paint hits a body that is definitely not moving any more. (1) See ‘Big Dog’ - the robotic doc that accompanies soldiers to the front line and carries their equipment (the first Big Dog could shortly be sent to Afghanistan). 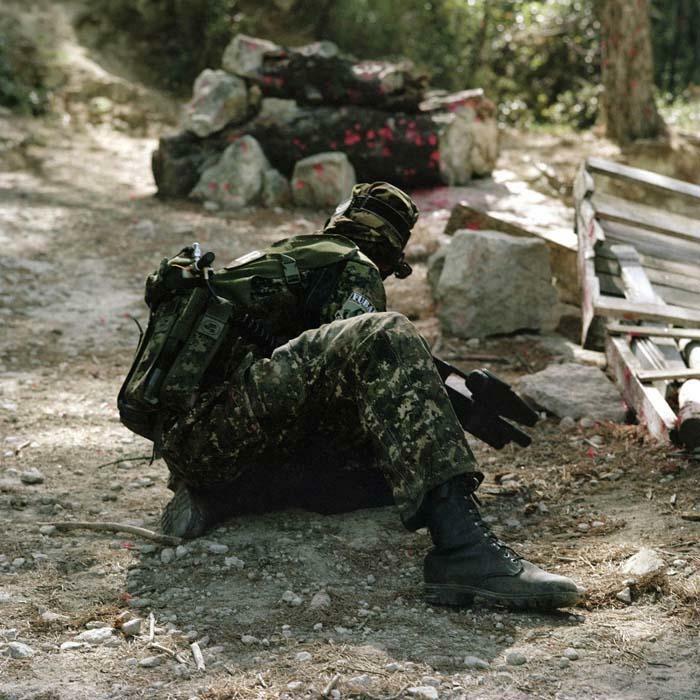 (3) Remember the Collateral Damage (2001) series of photographs acquired from a press agency by the artist Gianni Motti. 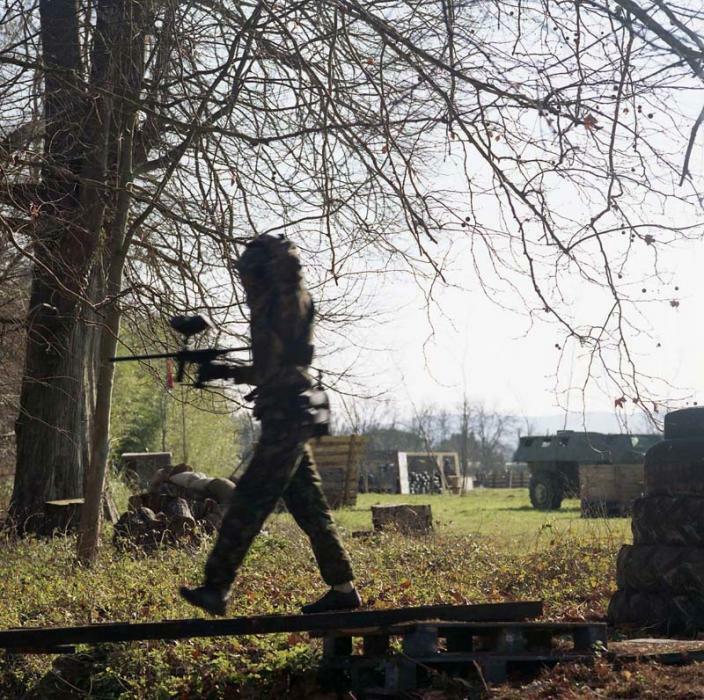 Unused photos from the Kosovo war that could at first inspection be representing something completely different, as they don’t substitute their truth to the hyper real format. Green landscapes, stone houses, no dead bodies or destruction, the war with almost no action, just a smoke plume signalling an explosion. Diffuse violence, so terribly apparent in these Macedonian landscapes. It shows a reality of the war that precludes the virtualisation of spectacle.